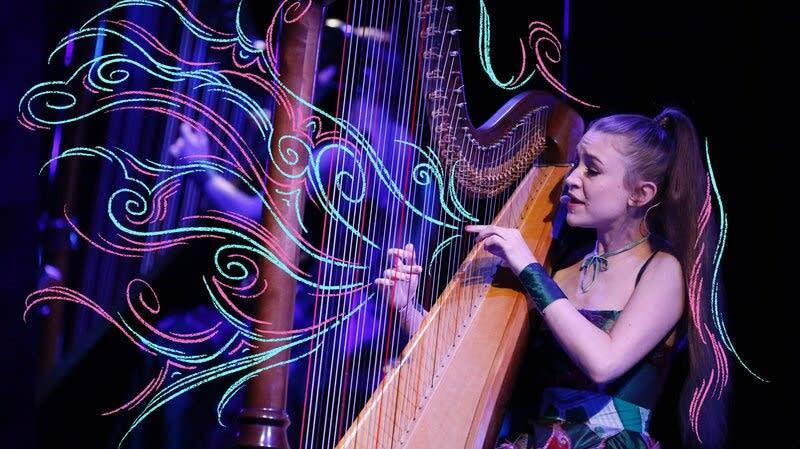 Since the early 2000s, Joanna Newsom has challenged the independent music world's standards of what a feminine voice can be. Hers is strange and unrestrained, pushing and pulling recklessly. It is also uncompromisingly girlish, as critics have oft described it. Like the multi-layered metaphors and double-meaning wordplay that laces her lyrics, in Newsom's world, rare and rich dualities exist. She shouts, screeches, creaks and coos. And yet this is all entwined within her distinct femininity: her high-pitched inflection, masterful harp playing, epicly emotive lyrics and intuitive writing. There is a sense that she is following her voice where it goes, but she goes there gracefully and attentively, matching her syllables with the most emotionally suited turns in her voice. With her gritty girlishness that critics have often infantilized, she's also an arbiter of wisdom, of expertly crafted folk songs rich in metaphor and mythology, and an expert composer. Throughout her discography, her deep love of history and literature has shaped a collection of poetry that stands up on its own on the page  words that jump with the alternatingly chilling, pensive and glistening presence of her harp, her lines syncopating with the plucks and hums of the strings. She bridges folk traditions with enormous arrangements for concert halls. "Am I so dear? Do I run rare?" she asks near the end of "Peach Plum Pear," one of the more immediately effecting songs from her 2004 studio debut The Milk-Eyed Mender. Stretching each of those last two words, the questions come amid her pondering of a soured romantic interest  "You've changed some / water runs from the snow," she shout-sings earlier in a choir of one, enchantedly reflecting on the slow fading of what was. But as she sings over a bright, sticky harpsichord loop, these two simple questions seem prescient of ones she'd likely consider as the music world grew shook and split by her beautifully unusual work. In a more just world, Newsom's voice would never be compared to a child's. To suggest that Newsom's voice is like that of a little girl is to suggest that only children should express themselves so uncompromisingly. To call Newsom's voice childish is to accept the ways society encourages self-consciousness that eventually stomps out creativity. Indeed, Newsom ought also be celebrated as a defender of those expressive, child-like impulses that are torn away too quickly. This all makes sense. Newsom's musical language exists in opposition to the type of music that is served well by the streaming landscape: a space that favors music that's poppy or otherwise chill, that gets to a hook within 30 seconds, or that can flow easily into another artist on a playlist. Much of Newsom's music is unplaylistable, and in fact, against the logic of playlists entirely. Take, for example, one of her greatest works, the 12-minute opus "Emily" from what many consider her masterwork, 2006's Ys. The album was produced with Newsom alongside the legendary composer Van Dyke Parks, who arranged its orchestral instrumentation. "Emily" is an ode to Newsom's astronomer sister, but also more generally to sisterhood, family, memory, love and loss. It's told through a winding series of memories and vignettes where Emily and Newsom watch birds and skip stones; Emily teaches her about the stars, and in the song's second half, cares for her in times of intense difficulty. "I've seen your bravery, and I will follow you there / and row through the night time / so healthy," Newsom sings. When Emily eventually moves away, and Newsom shouts for her to "come on home," it is quietly devastating. In Newsom's world, there are songs within songs, places to get lost in. There's a reason Newsom calls her most dedicated fans "the delvers"  this is music for close, careful listening; for delving, not background sound. These are songs that resonate most strongly within the environment that Newsom crafts on each album, whereas streaming playlists strip music from its context. Of course, Newsom's discography can be appreciated for its pure beauty, too, without such delving. One need not know the story behind "Sapokanikan" (from 2015's Divers) to hear her gorgeous piano playing, or feel moved by a meandering verse like, "Do you love me? Will you remember? The snow falls above me." But diving deep is a worthwhile endeavor. In fact, "Sapokanikan" sheds light on hundreds of years of lower Manhattan history; the song is named for the Native American village that once existed nearby what's now Greenwich Village. Here, Newsom offers a sprawling meditation on history, death and erasure, pointing to the 20,000 bodies that are buried below Washington Square Park: "The cause that they died for are lost in the idling bird calls / and the records they left are cryptic at best / lost in obsolescence." To begin unpacking the scope of what Newsom is raising up here requires not just careful listening, but a willingness to follow the threads she has provided  to decode her references to poems and paintings and political figures and lore. The beauty in Newsom's music is often in how she strings together these tremendous portraits that have the ability to transport listeners to different places in space and time, not by teaching, per se, but providing a map with which listeners can teach themselves. Newsom's music offers a particular gift in this way, inspiring listeners to get lost on their own journeys. Recently I learned that one of my favorite singers, Frances Quinlan of the evocative Philadelphia indie rock group Hop Along, considers Joanna Newsom an influence. Quinlan calls Ys "by far one of the most affecting albums of my life." She says the inspiration has been most palpable to her as a painter. "Her songs themselves seem to be paintings, especially on Ys," Quinlan says. "Voices can so often get in the way of what one means to tell. For me, hers makes a new environment that I feel so able to explore, and even confident to create on my own, because of a strong understanding I feel." There do seem to be shared musical sensibilities: in Quinlan's huge, illuminous voice; in that sense of limitlessness, of expressiveness in every turn of phrase. When I think, additionally, of the songwriters in turn inspired by Quinlan, I can't help but think of them in a continuum of sorts: a lineage of voices, unlimited by genre, exploding what's acceptable. Attempting to destroy the deeply entrenched male-dominated pop canon will be an endless, ongoing task. Part of that task will be found in conversations centered on complicated questions: What types of femininity has the music industry historically allowed? What has history expected female beauty to sound like? What has been deemed acceptable for the female voice? Newsom's work pushes forward new answers to these questions, her complex voice sharpening her complex songcraft in unparalleled ways. Listening to Newsom's work viscerally feels like hearing an artist born out of time, but who, in turn, sounds utterly timeless. Copyright 2018 NPR. To see more, visit npr.org.